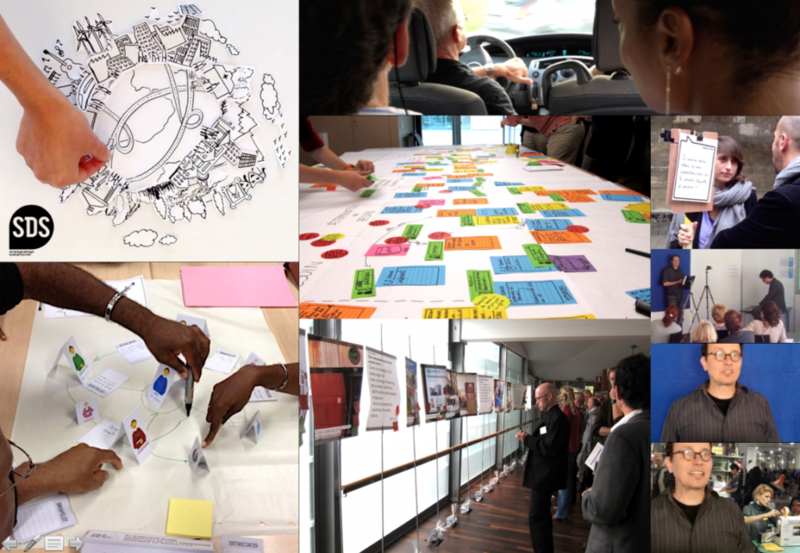 Strategic Design Scenarios is a sustainability innovation lab specialised in strategic design, scenario building, co-design with users and community centred approaches. And we do this since 2003. SDS activities are based on projective techniques such as story-telling, story-boarding, scenarios scripting. In particular SDS co-develops visual forms of scenarios based on short video clips or sequences of still images to facilitate the engagement and the strategic conversation with citizens and local stakeholders. SDS research activities are focussing social innovation, sustainable living, collaborative services, design for behavioural change, local development and regional/urban planning by an acupuncture of micro-projects. The lab is active in various fields such as energy use, sustainable cities, public service innovation, emerging uses, interaction design, social inclusion and education. Offices are based in Brussels and offer facilities for co-design and interaction with users. The studio is equipped for video-sketching, rapid prototyping and product-service systems simulation. SDS has been involved in various European Commission funded research projects investigating the emergence of sustainable solutions and future ways of living (CORPUS, SPREAD, EMUDE, SUSHOUSE), the design of product-service systems (TURAS PSS, HiCS, MEPSS), the innovation process in small and medium-sized enterprises (INFU, UCIM, E-VAN, ADAPT), the impact of augmented workspaces (AMBIENT AGORAS) and the creation of deliberative processes on Nanotechnologies (NANOPLAT). SDS collaborates with the 10th Framework of Programmes on Sustainable Consumption and Production supported by UNEP, UN DESA and the Swedish on Sustainable Lifestyles and within WWF One Planet Mobility program. SDS also works on the future of Agenda 21 programs and accompanies territories in developing local prospective visions and scenarios. SDS worked at both a national level (with the French Ministry of Sustainable Developement and the belgian ministry) and local authorities (Agenda 21 of Saint-Orens, Gironde, Saint-Gilles, Molenbeek, etc.). SDS is also following the TESR program in Nord-Pas-de-Calais (conducted by the Regional Council) which is exploring/experimenting the Ecological and Social Transformation of the Region through 9 Developement Operations on diverse aspects (food, energy, education, health, etc.) and over a three to 5 years period. Lyonnaise des Eaux (new water services); Castorama (co-design with users); EDF Electricité de France (PSS energy saving); SPA mineral water (business strategy); TNO Dutch Research & Technology Centre (PSS in augmented health care); Pierre Fabre Pharmaceutical (new products strategy); Cité du Design (service design scenarios); PSA Peugeot Citroën (strategic marketing & design); EDF R&D (strategic design office work); Merck Generic (product strategy France/Italy); IFEC (packaging foresight club with 20 companies from all the chain), Indesit (product strategy); Same/Deutz-Fahr/Lamborghini (PSS scenarios); Belgacom Proximus (corporate strategy); Barilla pasta (product strategy France/Germany/Italy).